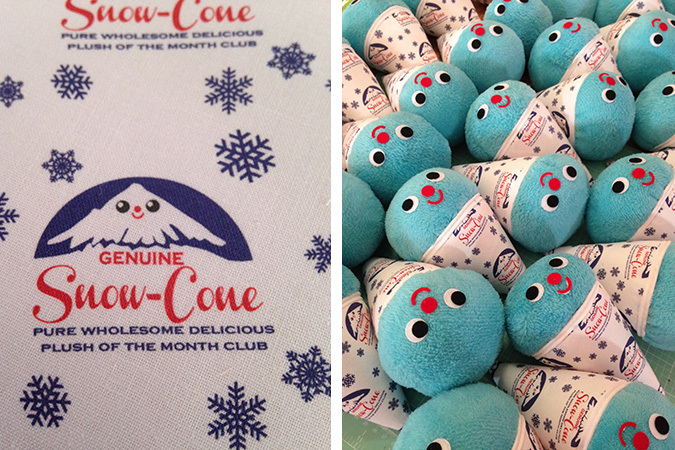 Plush Of The Month club boxes for January were I hope an unexpected plush for members. 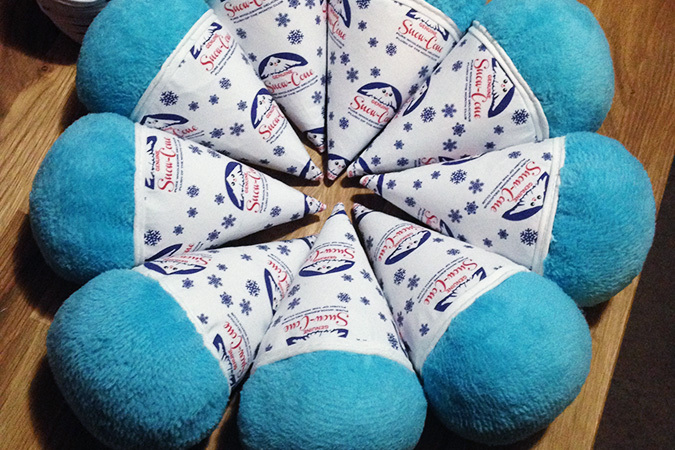 When I was thinking about what to make I kept thinking of snow, and cold, and then I thought it would be funny to make snow-cones. Something you usually think about in the middle of Summer, but also snow related-so also fitting for January. 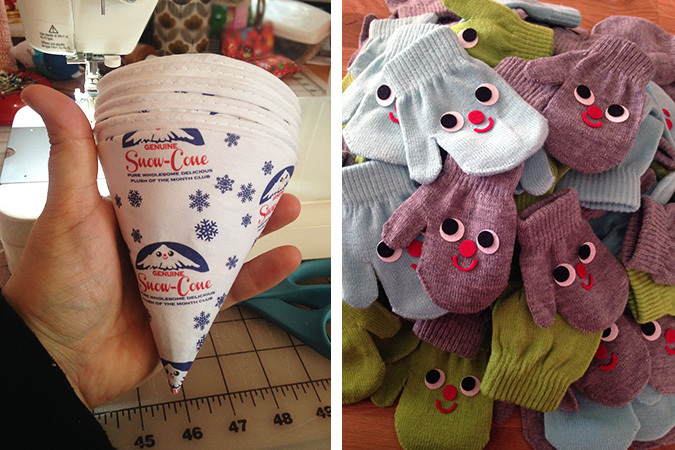 I first created the fabric for the cones based off that iconic paper snow-cone wrapper you usually think of, but with a POMclub twist. 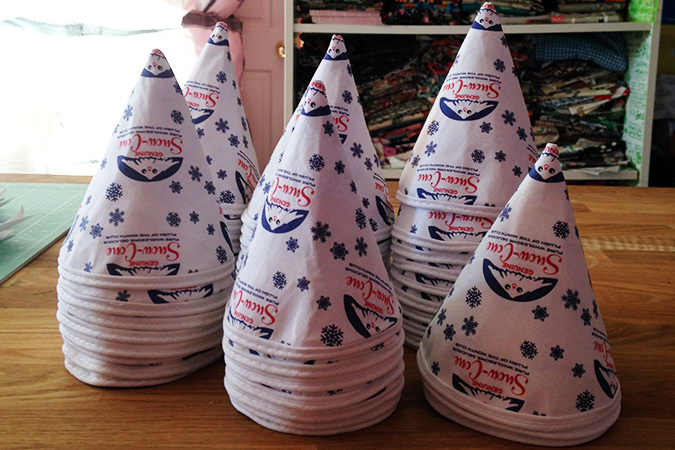 I had the wrappers printed with Spoonflower, and set to work sewing them up and creating big stacks of cones. I felt like I was getting ready to open for business. 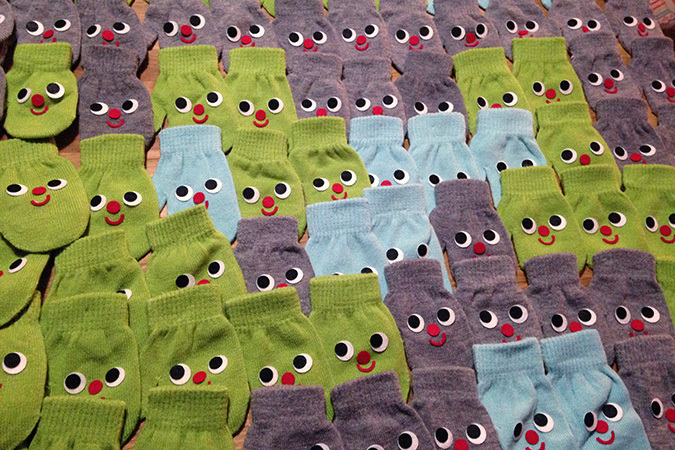 I bought loads of little mittens, added faces and filled each one with an assortment of candy to ship out with the boxes. 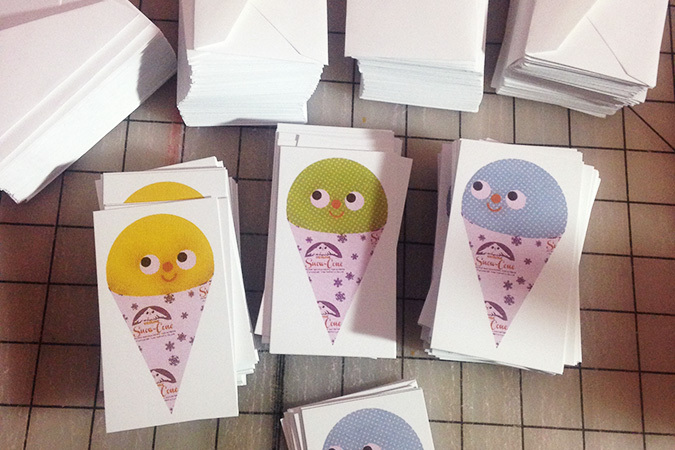 I also created mini card sets featuring 3 little snow-cones and tiny matching envelopes. This was one of my favorite boxes to work on, except for the furry blue fabric. 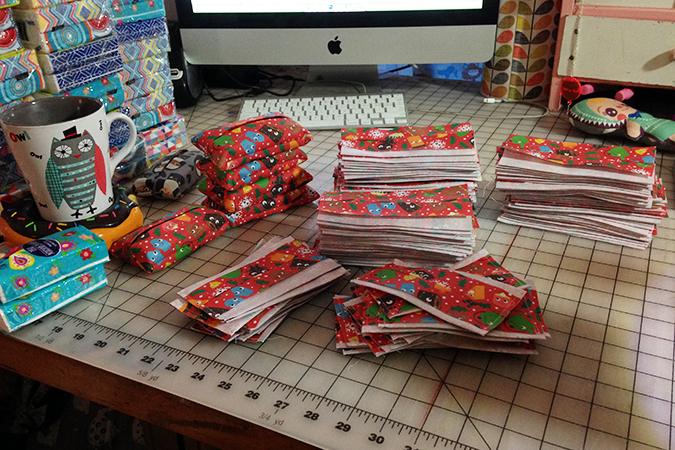 I’ve used that fabric many times before and I never seem to learn my lesson on what a mess it is to work with. 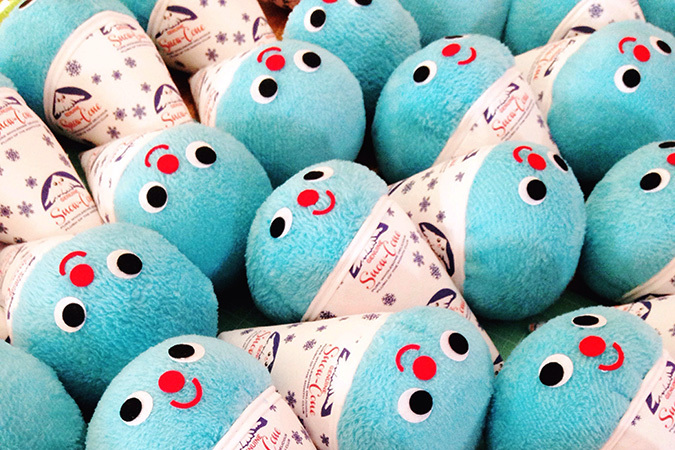 For weeks after, no matter how much I clean I am still coming across blue fuzzy balls from it! 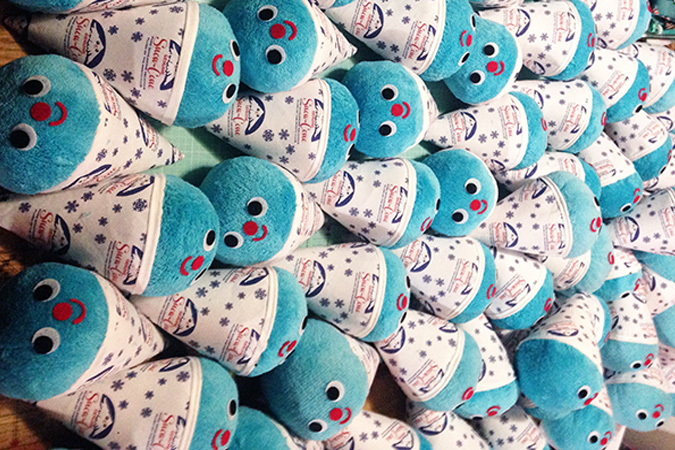 Here I thought I was done with photos from December when I realized I never even shared December’s plush of the month club. 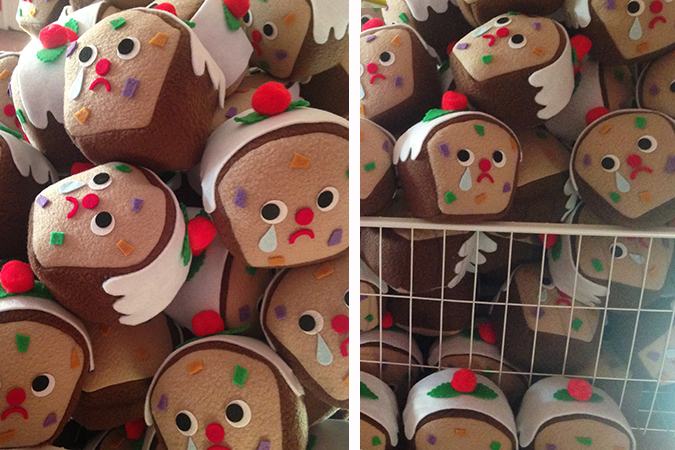 For these boxes I decided to make a bunch of sad fruitcakes. Everyone knows fruitcake has a bad rep, and I thought it would be fun to play on that. 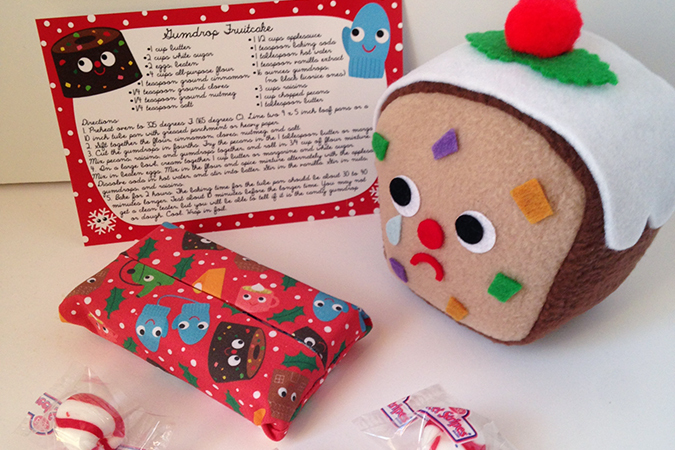 These little fruitcakes are even dressed up with white icing and festive cherry but that cannot stop their tears. 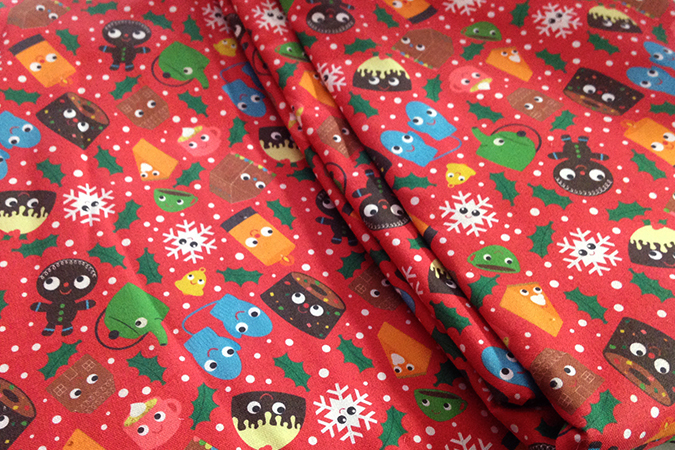 I thought as an add-in a tissue cozy might be nice, so I resized and made a few adjustments to my holiday fabric and had 8 yards printed with Spoonflower. I bought mini tissues in bulk to put inside because a tissue cozy without tissues meant you wouldn’t be able to use it right away. That’s like getting a new toy and no batteries! I created a recipe card for a faux fruitcake that is made with gumdrops in place of the dried fruit. Its one of those kooky old recipes that I thought would be fun to include. I know a lot of kids get my boxes and I didn’t think they’d want a traditional soaked in rum fruitcake recipe to bake. As for the candy I added in some peppermint puffs. They are the kind that melt away in your mouth a favorite in my household. 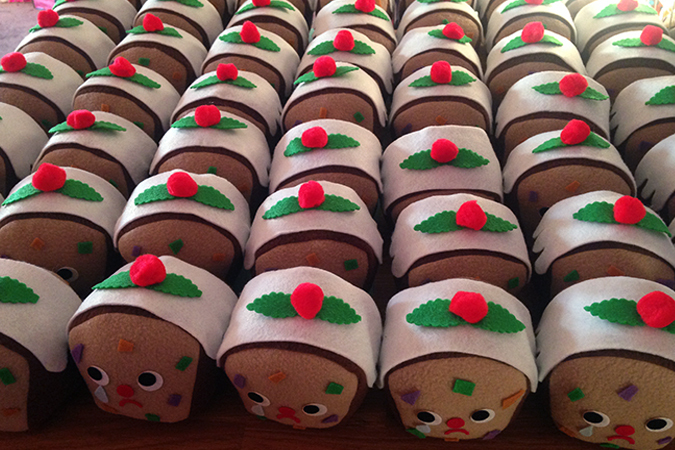 Here is a look back into the creation of POMclub’s November box. 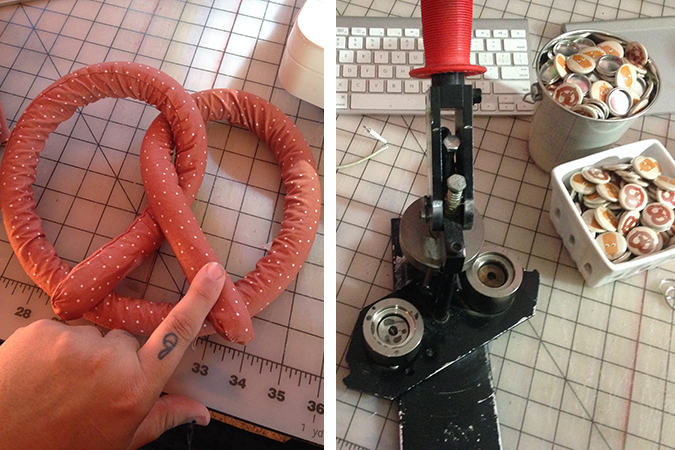 While I thought about doing something related to Thanksgiving (you might remember that November of 2014 boxes had faux turkey legs) I was really excited about the idea of soft pretzels, so I decided to go that direction instead. First I had the idea to design a fabric so it looked like it had salt all over it. 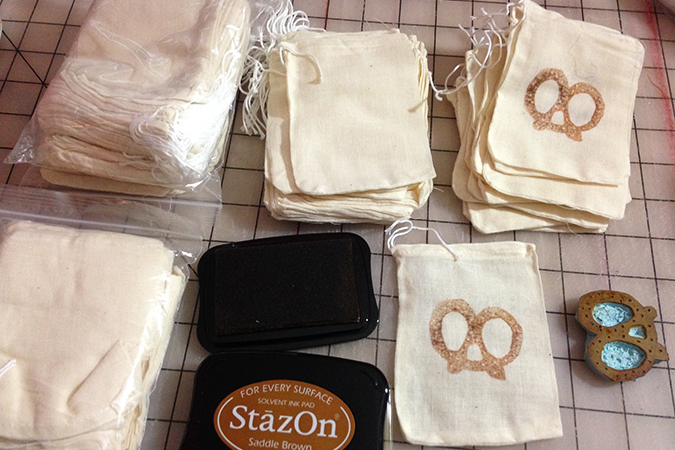 I designed a few with various shades of tan and ordered a swatch from Spoonflower to decide on the pretzel shade before placing my large order. 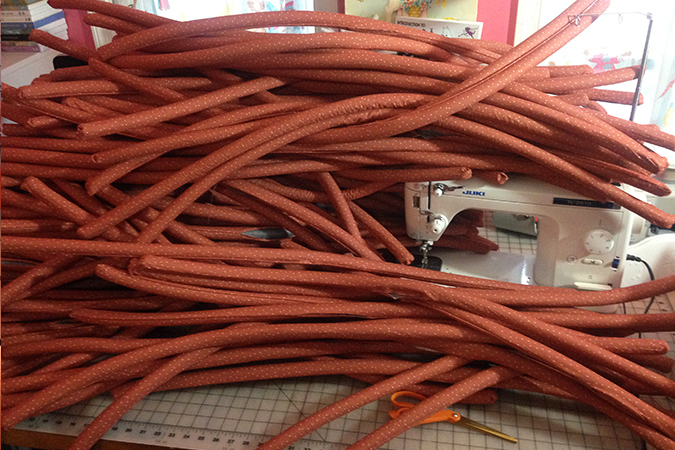 Once the fabric was proofed, I ordered my big roll of twenty yards of fabric. 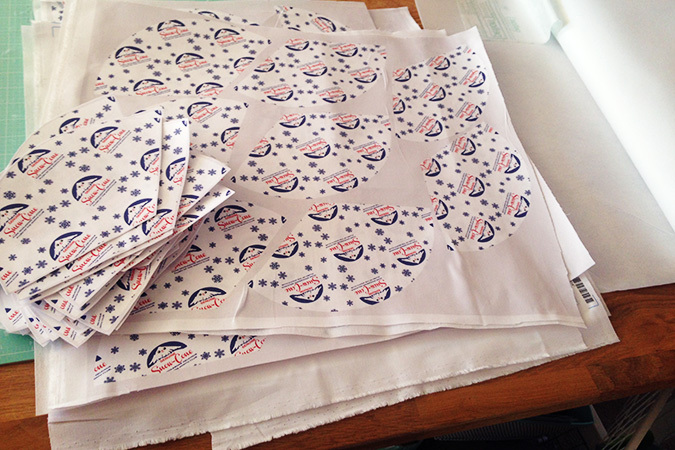 When that arrived it had to be measured, cut and sewn into tubes. If you’ve ever turned skinny tubes right side out you’ll know that this part of the plush assembly was interesting. 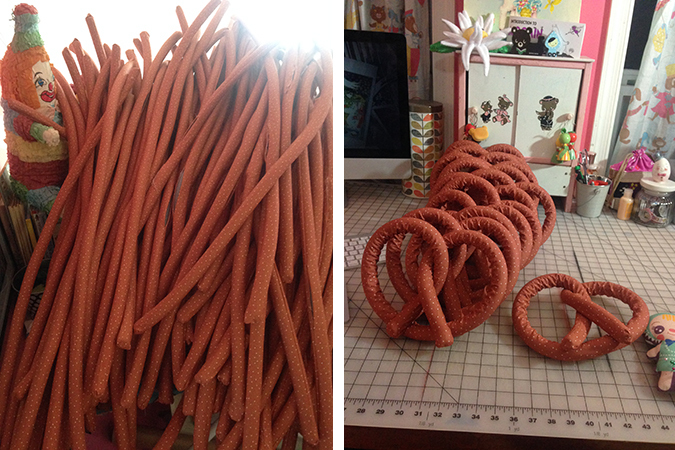 I had been thinking about the pretzels and how best to fill the tubes long before I started proofing fabric. Polyfil was problematic because it took such a long time to stuff each tube with small puffs of polyfil, and once filled there would be small gaps between each puff. 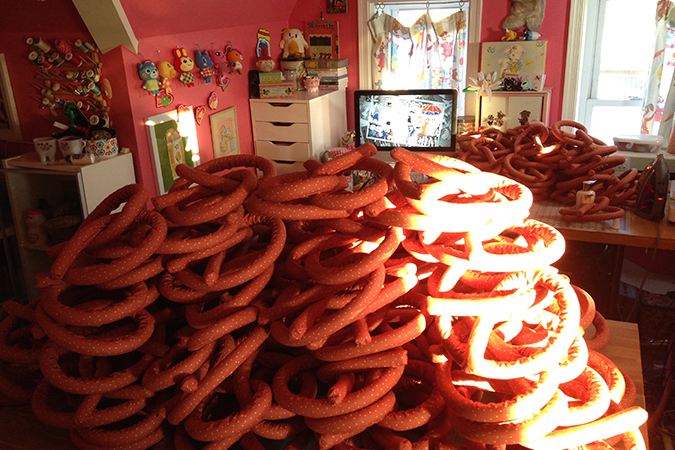 I knew that I’d have to think of something else if I was going to make the pretzels a reality. Finally with some research I stumbled upon foam tubing. Again I had to request samples of various typos and sizes before finding one that was perfect, but in the end my fabric from Spoonflower and giant roll of foam tubing ending up arriving on the same day. 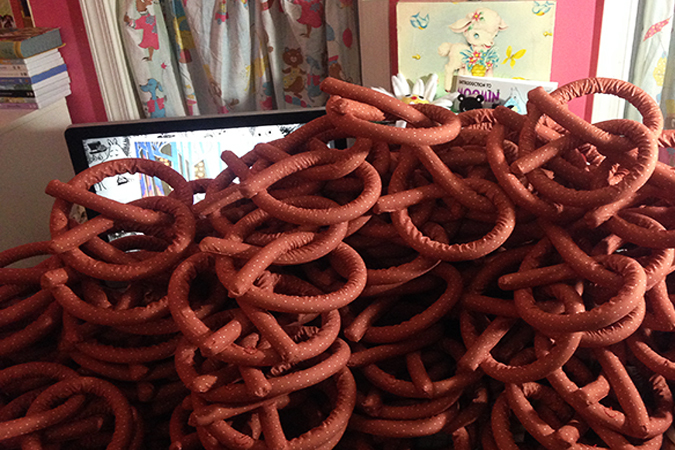 As you can see there were pretzels upon pretzels! Once twisted I had to hand sew the ends in place, and add the faces as usual. I watch a lot of Hulu & Netflix during this part of the process. I had ordered some kooky “mustard pack” gel candy to go with the pretzels. It is lemon flavored or something, but looks like a pack of mustard which is just how I like a soft pretzel. 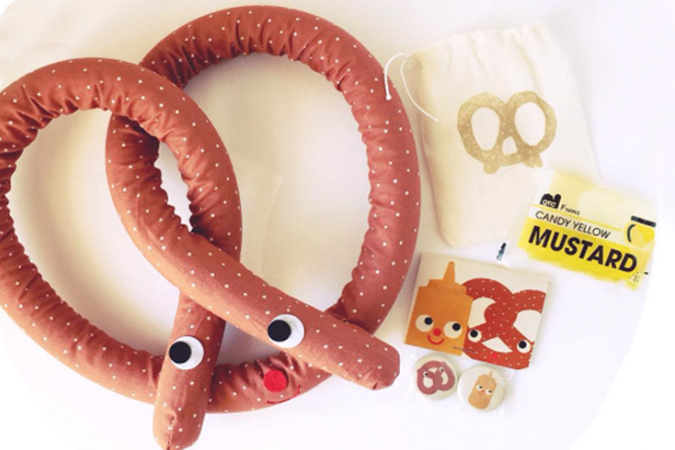 I decided to make button packs with a pretzel and mustard to go with them. 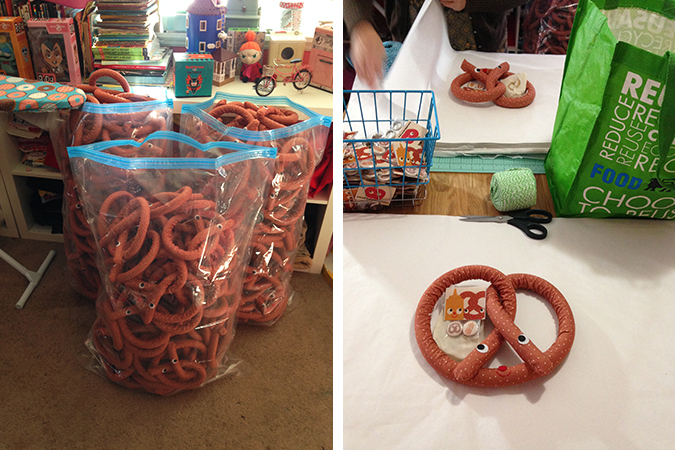 I was afraid of the gel candy leaking during transport, so each one was sealed inside a small ziploc bag and then nestled inside a pretzel stamped drawstring bag. Packing of the November boxes was made easier when my sister came over to help wrap and pack them up. She draws the line at any kind of sewing work though. 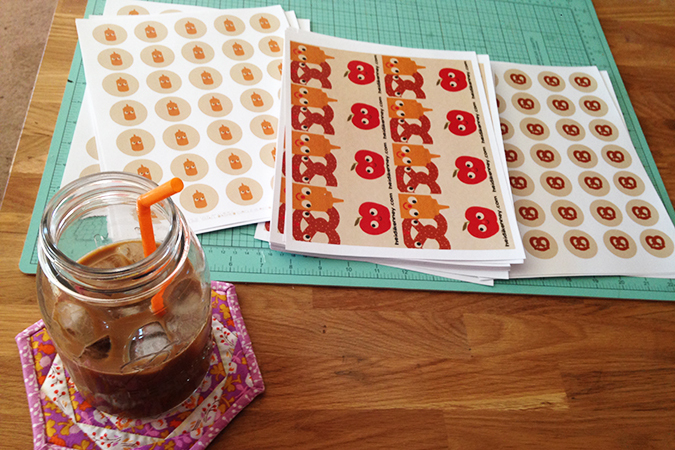 Help packing up orders is awesome and I’ll take it! I’ll be back again soon to show you what was shipped in the December boxes, and before we know it I will be sharing what shipped out at the start of january.